Long associated with the sun and its life-giving warmth, yellow is the age-old spokes-color for warm feelings of friendship and optimism. The significance of yellow roses makes them perfect for occasions such as birthday parties and events. However, nowadays yellow roses are gaining more and more popularity in the wedding industry. That’s why we roamed the internet for you to compose a list of 25 inspirational bouquets with yellow roses. Contrary to popular belief, yellow roses are not just a perfect fit for summer; the soft yellow shades also make up for a perfect fall bouquet! dusty miller, dahlias, ranunculus, yarrow, and, of course, roses. Lovely bouquet featuring Toulouse Lautrec roses. Yellow and white wedding bouquet with yellow roses, craspedia, calla lilies, stock, and baby’s breath. hydrangea, yellow roses, light blue delphinium, dusty miller, and seeded eucalyptus. Summer wedding bouquet with yellow roses and white peonies. Soft yellow roses and bright sunflowers make a wonderful combination, don’t you think? A variety of yellow roses make up for a vibrant spring or summer bouquet. The combination of soft yellow and soft pink makes this a sweet and summery bridesmaid bouquet. Country style wedding with baby blue and yellow roses. Bridal bouquet with yellow roses, calla lilies, craspedia, and queen anne’s lace. Bouquet with yellow roses that has an autumn sort of feel to it. 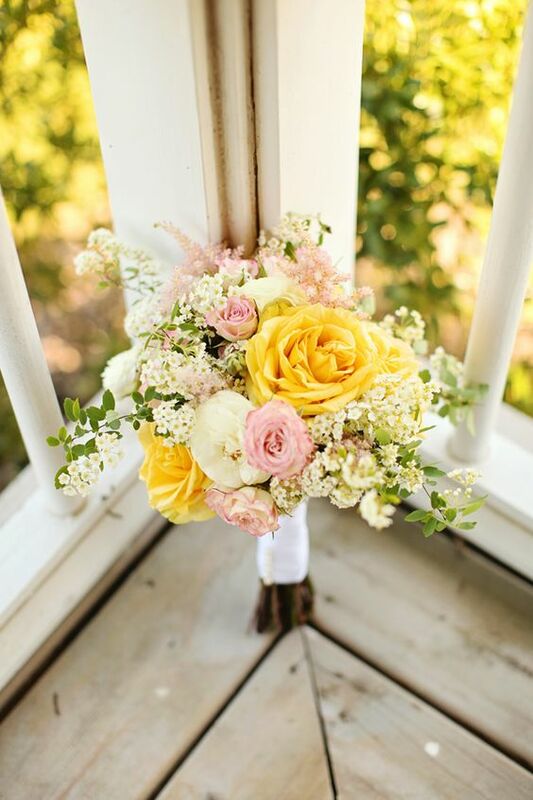 Beautiful and intimate wedding bouquet with the softest shades of pink and yellow. For a softer look and feel of your wedding bouquet, Caramel Antike is a definite must have! Sunny wedding bouquet with billy button, yellow roses, and white aster. Mustard yellow roses make up for a pretty stunning rustic wedding bouquet! Bold and brilliant wedding bouquet with yellow roses. Sweet and wild wedding bouquet that could be perfect for fall as well. Soft and beautiful combination of Patience roses and Caramel Antike roses. Summer vibes all over with this stunning bouquet with yellow roses. PS. Want more inspiration? More roses? Come join us on Facebook!